One of the many online events at Shaastra (IIT M annual technical fest) is the Google Event – SEO Competition, where the participants are given a search string (durbatuluk shaastra equivocate coecelanth zeppelin) the search of the permutation and combination of which must result your page on top. The allowed web-hosts were: www.tripod.com, www.blogspot.com, www.livejournal.com, www.wordpress.com, www.googlepages.com. As expected most participants chose wordpress.com and blogspot as their platform for the event. 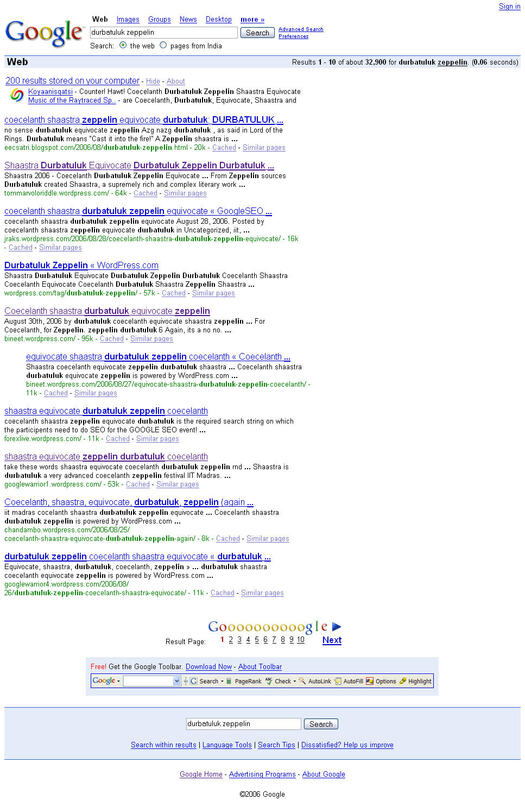 A screenshot of the google search for “durbatuluk zeppelin” (Try clicking the links in the search results). Apparently someone seemed to have tipped off wordpress on how this SEO contest is spamming wordpress and using its various resources. The quick wordpress feedback system, led to a mass deletion of such blogs. Google followed suite. I made an entry for the competition with http://bothackr.blogspot.com. Now the blog no longer exists. At first I was astonished to see my blog missing today morning. But after surfing about ten mintues I figured out that most SEO blogs were deleted. Fair enough! But what irked me was, I wasn’t intimated nor conveyed the deletion of my blog by blogger. It’s just gone. If I hadn’t visited it today morning, I wouldn’t have known whether my blog existed or not. Secondly, Matt addressed the issue in the wordpress blog. But google just dumped our blogs. I along with my search strings had also posted a few important links and references and happenings in the recent past. Everything is gone. If google had intimated me, I could have at least backed up my posts. What is worse is now my blog reads “404 page not found”. Google here is a piece of advice: We know you guys are the best, but now you are going overboard, my sincere advice to you would be to maintain your PR (You seem to have forgoten about Public Relationship after Page Rank was introduced). Just because you are monopolizing the industry doesn’t me you take such rash actions. I was shocked to see my blog gone without a trace (except for your search engine results which still point to my non existent blog). I have lost a good amount of information, links, bookmarks and logs apart from my SEO entries and I am seriously pissed off. Its just not me, but a bunch of guys who used blogger. I agree SEO competitions implies splogs. But c’mon one can’t just delete stuff without notice, or at least informing the owner. Many people unlike me, have spent their whole morning trying to figure out how their blog got deleted. A small mail to them, would have at least saved their time. We all would definitely appreciate if you guys were more friendly. Its just not good ‘not being evil’ anymore, get friendly. I tell you one thing that all blogs are not spame so if you take some action to punish spame blogs that does not means that the fair blogs suffer by the action. If you inform the blogger about your action to remove or something else then it will make better understanding between blogger and the blog site. If you do something than it is good approach for the future. I agree cent percent with you. I would have liked it if google had done what wordpress did. Archive the blog, put a public post and inform every blogger. Google had done similar evil thing one fine morning with me and deleted one of my blogs considering it’s spam. Secondly, when I tried to contact them like 100 times for activation of the blog, they completely deleted my account itself. So other blogs were also deleted along with that. And they did not care to even drop a mail or reply to one of my mails atall. I still use blogspot, there are reasons. It’s really user friendly, or I might be habituated to it. And I also understood that avoiding any spammish looking activity (Like using “mail to post” feature for any of the blogs – probably that was the reason for the first deletion). Now for my current blog, techiecorner, I specifically login to blogger and add my posts. The only reason I think why people stick to blogger, is because of adsense and may be like you said easy interface. But I prefer comfort. I would rather blog thro’ qumana and not worry about my blog disappearing without intimation. I still stand by the fact that google does no evil. But they are not friendly either. Lets take your case. You lost all your posts without any trace. May be you could handle it. But if I lose all my posts at BotHack I would go crazy. Its a lot of hardwork and lot of knowledge archived in here. It would take me years to repeat the samething from scratch. I feel sorry about your blogs getting deleted. Interesting you searched for that “durbatuluk zeppelin”, and not the full search term. You can mail and ask them to activate ur blog again on the condition that u will delete all SEO entries. Wordpress users have done the same and have got precious blog back. Hey it seems that ur this blog is now also blocked. Which is exactly my point. WordPress has a good feedback system. They firstly never deleted your blog, they archived it and since your feedback system is great, it wasnt difficult getting the blog back. I am not very sure about the google blogger feedback system. But point taken, I should have checked it out. uh huh? I quite didn’t get your point there. Bot-Hack seems to be running fine with me.